Home Our Garage Door Services Garage Door Repair Services Is It Time To Call a Professional Garage Repair Company? Garage doors aren’t to be taken lightly, quite literally. They can weigh more than 400lbs, so aren’t exactly the sort of object you want to be messing around with. This being said, you should save your tinkering and DIY ambitions for other items around the house, and leave repairs to the professionals. Though you can perform some basic maintenance yourself, anything else should be left to the experts, who can use years of experience to address your needs. How do you know when it’s time to call for help? This article will explain some common problems to look out for, which should give you an idea of when to call for help. A non-responsive door indicates either a poor connection, a malfunction, or a need for a replacement battery. The latter can be dealt with quite easily, but the rest require professional help. If the problem persists, don’t hesitate to call an expert, because it could be a problem with the springs, cables, or safety sensors. In these cases, trying to correct the problems is potentially dangerous and should be avoided at all costs. Is Part of My Door Sagging? 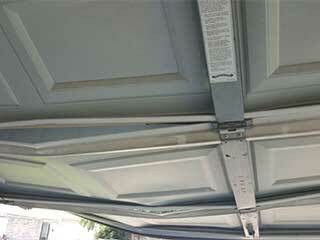 Your garage door’s balance should be checked monthly. You can do this by disconnecting the door from its opener, before manually raising and lowering the door to around the midway point. If the door rises or falls, the tension springs are probably out of whack. This is another issue that can’t be remedied yourself, so again it’s best to call for professional help. Garage doors are naturally quite noisy at the best of times, but if yours is squeaking and scraping, call for help. Any unfamiliar noises should wave a red flag which should be addressed by a professional. It might simply be a case of lubricating the parts involved or could be something more serious. Either way, there’s no harm in calling for an assessment. Amplified noise is a concern, in which case you should look to get the issue resolved sooner rather than later.